Cadets leave. From four cadets arriving a week ago Friday, one left Wednesday, one Thursday and the last two today. It sure is quiet around here. I am bored. Friday. I took Friday off and got up early for an eight mile hills run. 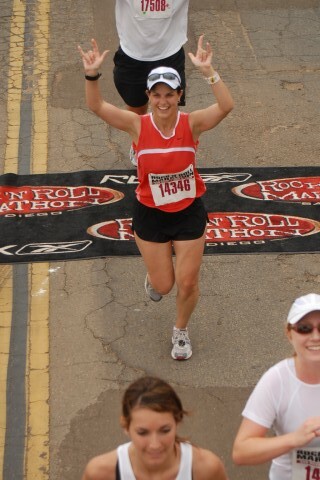 It was hot, around 70, and I worried whether I would make it through. I kept doing four one-mile loops of constant up and down hills (short ones but constant). It was supposed to be a tempo run but I opted for marathon pace "hills pace" (whatever that is). I found cadence to lull me into a state that allowed me to get it done. While running I strategized about my "breaks" during the race; when I would stop for Powerade or water. I decided I would be smart to replicate my training habits which call for a drink every 3-4 miles. Art. 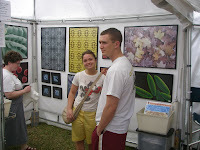 After my run I hooked up with T and his fellow cadet and we toured the Winter Park Art Festival around lunch time. The sidewalks were not as jammed on Friday as they would be over the weekend so we got to see all the art we cared to see. It was a nice warm day still so I had an ice cream bar dipped in dark chocolate rolled in nuts. Mmmmm. Not as good as at Costco for twice the price but.... I was not at Costco. Guitar Hero. Okay, the distraction of spring break was a PlayStation game called Guitar Hero. 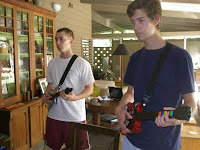 With simulation guitars the object is to play the notes on the guitar neck in time with the rock music playing on the TV. The kids scored well. I stunk. Dining out. For dinner we went downtown where the art festival was closing down for the night but the beautiful people were filling up the bars and restaurants. We went to THE most popular place and saw friends, neighbors, runners, a judge, a US Congressman and lots of the beautiful people. The sidewalk tables were the most popular. We had one just inside the door and enjoyed a few majitos and a pasta dinner. Much fun was had by all. Saturday. A cool front came through overnight and while it was gorgeous outside, I never left the house. It was a big lazy day. I cannot even remember what I did. I think I watched a stupid movie. Sunday. My last "long" run. A 10-miler. We started downtown where the art fetival is set up. With no available nearby parking I was expecting few runners but eight showed up, all in gloves, tights, long sleeves, caps, etc. I had on shorts and a sleeveless top feeling just fine. The temps were high 40s. Does that make me ready to run a marathon in Atlanta? I took it really easy for the first five miles and then turned on some jets for the rest of the way. Multiply that by 2.5 and I have my race plan, hills willing. Forecast. Atlanta forecast for next Sunday morning is sunny, low 50s to start and reaching 70. I guess I better expect to be hotter than I like. But that's better than rain, wind and 30s. aw i know how you feel our houseguest of a week left today, it feels empty. I'm also familiar with Guitar Hero from some grad students that stayed with us a night around Christmas, they were all about GH. Have a good week leading up to your big race! what a fun week. and of course the beautiful people were there. YOU were there, right? It is taking FOREVER for this marathon to get here! Hurry it up, will ya???????????? i wonder if my parents will feel the same when we leave her house this week . . . and yeah, don't go clean the pool or anything foolish like that! Will the quiet house help you get ready for the weekned, or will the quiet be a distraction? I am looking forward to your race report next week! Sounds like you are ready for ATL!!!!!! And the art festivities sounded fun too! cool! i'm running ING too. see ya there! Glad to catch up with the posts...loved the revolver photo. Gee, never knew Army officers were that gorgeous...oh my! Have a great taper week, David, and a great drive up to Atlanta on Friday!